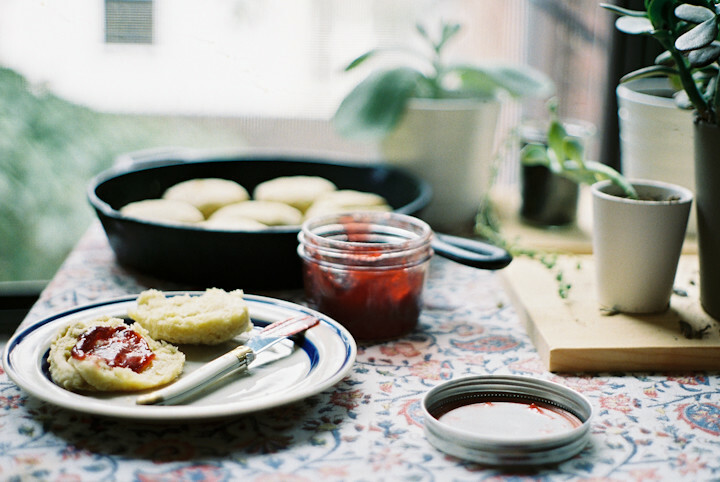 Yeasted Vegan Biscuits and Some Rambling — Apt. 2B Baking Co. I have lived in New York for a pretty solid chunk of time now and I am grateful that I get to live in such an amazing place, but most days there is a part of me that misses the Pacific Northwest. A big part. It’s tough to feel so deeply connected to more than one city and the constant pull between coasts has been at the front of my mind all summer. So when I was home in Seattle a few weeks ago I made a promise to myself to just absorb and to try my darndest to bring as much of that Pacific Northwest energy back with me as I could. When I was packing up and getting ready to leave Seattle, I found myself squirreling away little bits of home to bring back to New York with me: a tea towel, a few mugs and bowls I made when I lived in Portland, some jars of jam made from the fruit I picked with my parents, a set of beautiful gold rimmed tea glasses, and some tablecloths that I've always loved. The faded cotton tablecloths I grabbed are remnants of the life my parents and brother lived in Iran years and years ago. They have been witness to countless meals and conversations. They have spent time with members of my family that I will never get to meet. One of them even made the trip to college with me where I hung it on my dorm room wall alongside a print of Starry Night (I know, I know) and a concert poster or two. There is something to be said for the comfort and safety of familiar objects because just having these tablecloths in our east coast home makes me feel a bit more connected to the life I left when I moved to New York and it makes being here just a bit better.Biscuits for breakfast are mighty comforting too. Oh, and one last thing, check out the side bar for an updated about me page. Steve was my jam swap partner this year and he hooked me up with four delicious jars of jam (I don't want to brag but the flavors were peach melba, white fig with grapefruit, olliaberry, and white peach) and a recipe for his favorite jam vehicles (a category of baking that I have a high appreciation for): corn muffins and angel biscuits. I tweaked his biscuit recipe a bit to accomodate what I had on hand and realized when all was said and done that they were vegan, and the most tender biscuits I'd ever had to boot. For a more traditional version, swap the almond milk and lemon juice for an equal amount of buttermilk and 2 ounces of butter and 2 ounces of shortening. 1. Combine the yeast and warm water in a small bowl and stir to combine. Let stand for 5 minutes to give the yeast time to bloom. 2. 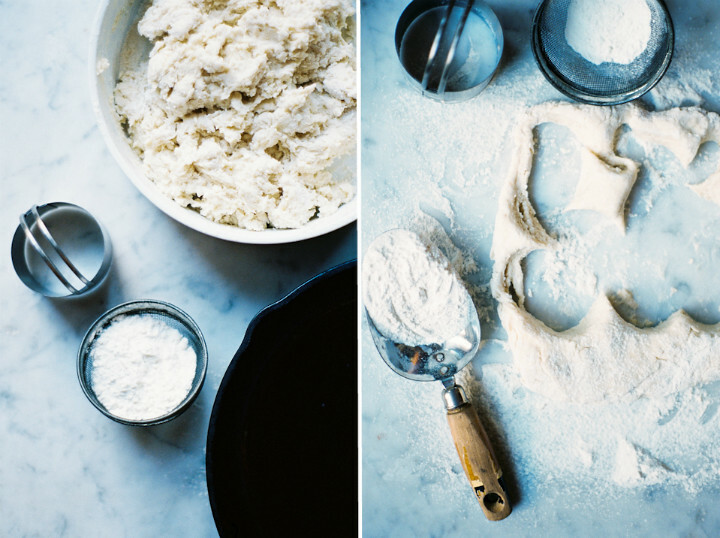 In a medium bowl, combine the flour, baking powder, baking soda, salt. Then cut the shortening in with a pastry blender until the mixture is crumbly but there are still small chunks of shortening visible. 3. Make a well in the center of the dry ingredients and pour the wet ingredients in. Stir gently until combined. Turn the dough out onto a well floured surface and knead a few times. Pat the dough into a rectangle about 3/4'' tall and and fold it in thirds. 4. Pat or roll the folded dough to a 1'' thickness and cut it into 8 rounds with a 2'' biscuit cutter. Alternately, you can use a pastry (or pizza) wheel to cut the dough into squares. 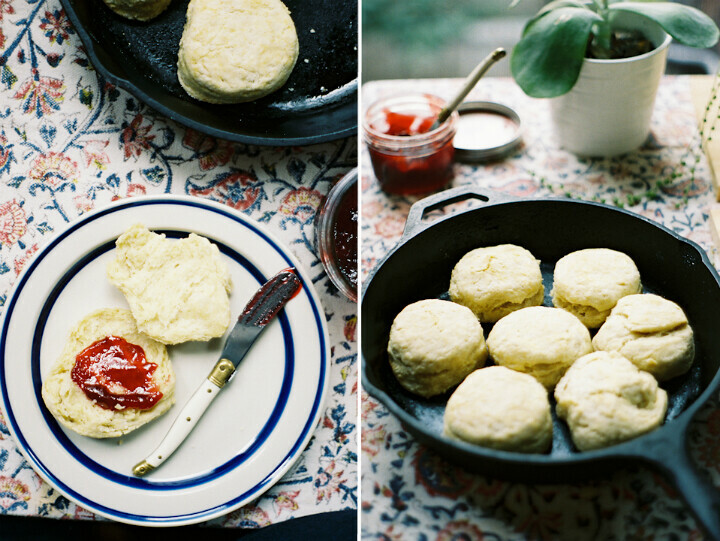 Place the cut biscuits into an ungreased cast iron skillet or on a baking sheet, just barely touching. Gently gather any scraps into biscuit shapes and bake those too, don't waste a bit of this delicious dough. Bake for 10-15 minutes or until light golden and cooked through.